Keep up with the trendiest neutral paint colors! We often feel like neutral paints can make a room feel boring. But that could not be further from the truth. In reality, neutrals are a beautiful way to create a blank canvas that allows you to decorate and give a room life with adding accent colors to a room. Working with neutrals can almost always be a fun process, and here are just some of the gorgeous neutrals you can find by Benjamin Moore. This beige shade is a magnificent option for those looking to create a cozy space that is not too light or too dark. This perfect shade complements almost every room. With the slightest hint of green, you may want to avoid using it in any north facing rooms due to the immense amount of light that can seep through. This is probably the most neutral color on this list. With it’s subtle greige undertones, this beige shade is highly desirable for many reasons. 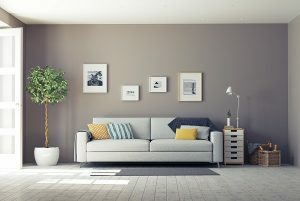 For one thing, it doesn’t totally have enough grey in it to make it a full on greige color option, but it does work as a perfect neutral in your home. In addition, since it is in the lighter range of color options, there is no worry that it will give off a warm tone in a room. The one place where it may appear a bit too dark is in a hallway where less light is able to make it’s way in. As one of the shiniest neutral colors on the market, this luxurious paint color is perfect for almost any room. With it’s subtle greige undertones, this color works perfectly in large rooms that get tons of natural light. However, in a north facing room it can easily pick up on it’s grey undertones which may make it a bit darker than some may like. In that case, try to avoid using this color in any north facing rooms to get the result you desire in your home.